Raven are true originals. Despite a few ups and downs along the way they’ve never given up, never surrendered, but stayed true to their own beliefs. The dichotomy though is that although I’ve never met anyone I’m not married to who doesn’t like the band, such popularity has never translated into the massive record sales that it should suggest. Meanwhile, every new Raven album is a bit like meeting an old friend again after a few years: comfortable in each other’s company you just carry on where you left off, and although it’s been five years – five years; can you believe it? – since the release of their last studio outing ‘Walk Through Fire’ ‘ExtermiNation’ finds the Gallagher brothers John (bass/vocals) and Mark (guitar) and drummer Joe Hasselvander still firing on all cylinders. And let’s be honest, an hour in the company of the band who famously declared ‘Rock Until You Drop’ – and almost certainly will – is never wasted. 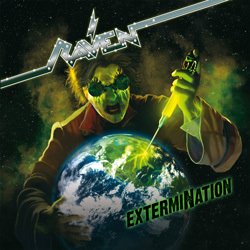 Although there’s not a lot ‘new’ on the band’s thirteenth studio outing – as with a Motörhead album, you pretty much know exactly what you’re going to get with a Raven release – ‘ExtermiNation’ is still a thundering body of work, with chainsaw riffs, solos of finger-twisting complexity and THAT voice which growls and howls and at times comes close to calling all the dogs in the neighbourhood to attention. The album boasts, naturally, a pretty bombastic opening in ‘Destroy All Monsters’ but swings across the band’s spectrum, with ‘Tomorrow’ taking down the pace but positively exuding menace (as does ‘River Of No Return’ later in the running order), the hammering efficacy of ‘Battle March/Tank Treads’ taking no prisoners and ‘One More Day’ showing once again that the band can keep to their chosen path and still write a snappy, hook-laden, sing-in-the-shower song. Elsewhere in the mix there’s a nice touch in ‘Thunder Down Under’, a tribute to Bon Scott which not only interpolates as many AC/DC titles as possible but also nails the band’s stomp perfectly, and the rather throwaway ‘Malice In Geordieland’ which if nothing else shows that the Gallaghers have neither lost their roots nor their sense of humour.